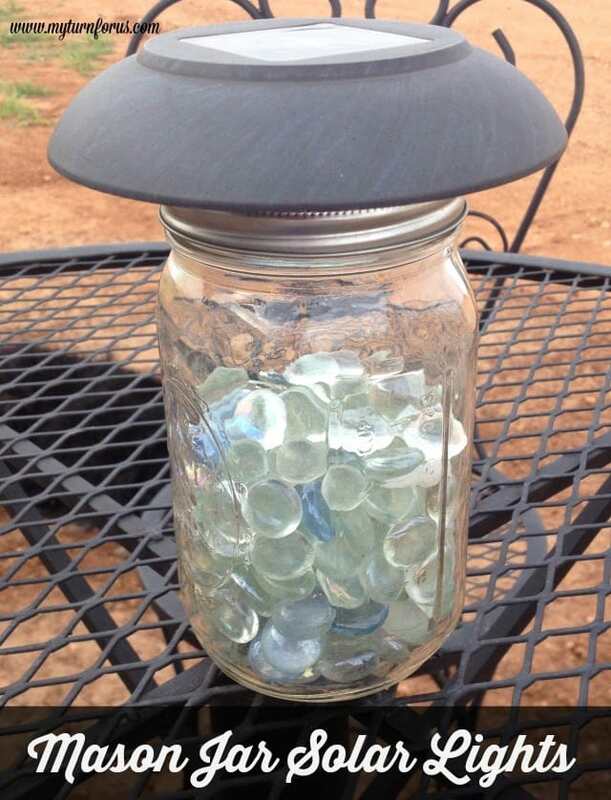 These easy Mason Jar Solar Lights are one of our favorite accents around the Ranch yard. They light up the Texas night with a soft romantic glow. I love yard lights twinkling in the summer night illuminating soft romantic areas around the yard. And one of my favorite things to do in the evenings is sitting outside and enjoying the cool night breeze and watching and listening to nature. I have several tables set around the Ranch yard where we can sit and have coffee or a beverage and just enjoy the end of the day and I needed a light on these tables. I wanted a soft light that I wouldn’t have to light but was heavy enough not to blow away during our spring winds. I hadn’t been able to solve this until one of my little lights down at the front gates was destroyed by falling debris during a windstorm. I remembered that my sweet friend down the road (ok 8 miles down the road) had made the cutest little mason jar lights from the tops of her solar lights when the bases were damaged. I saved the top of the light and gathered several other supplies. 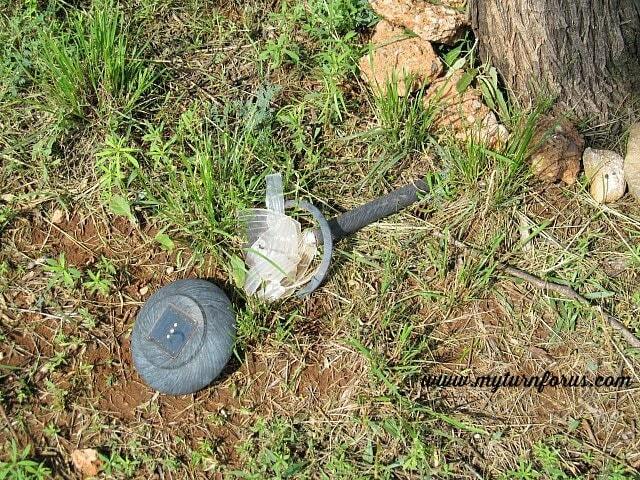 Unscrew the solar light from the globe and stick. Remove the cover from the batteries and remove the battery. 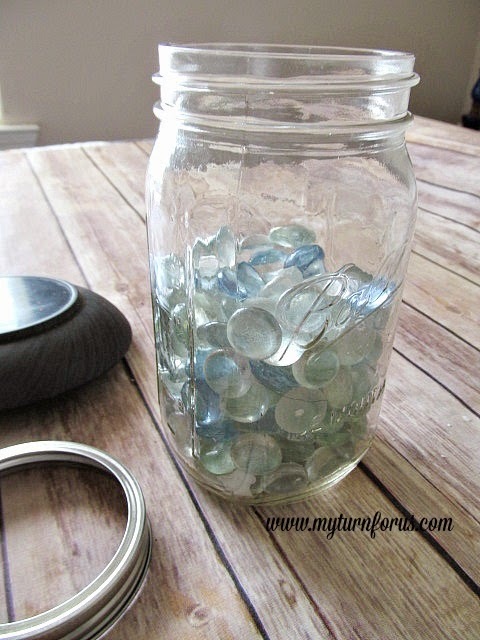 Pour the glass gems into the mason jar filling about halfway (about 2 cups of gems for a quart size wide mouth jar). Filling only halfway leaves room for the light to shine and the gems to reflect the light. 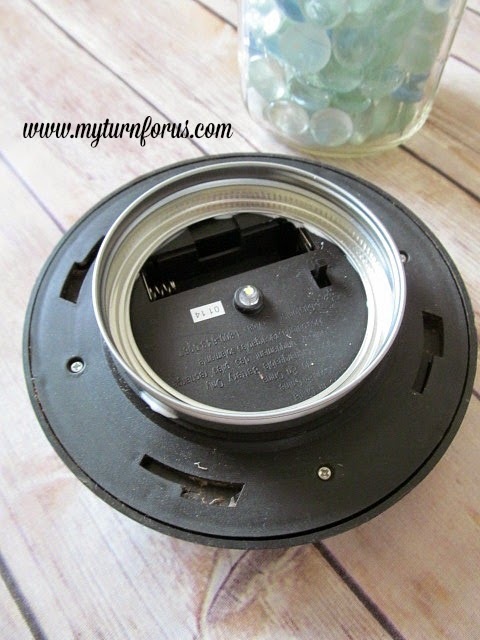 Center the mason jar lid ring on the bottom of the solar light making sure you do not cover the opening of the battery. Don’t worry about replacing batteries since the sun recharges the battery every day and you will enjoy maintenance Free lights every night. Glue the ring into place. But if the batteries ever are not able to recharge, then simply replace with a new AA battery, my lights are almost two years old and I have never replaced them yet but I know I can if needed. Replace battery and cover, and if needed file the corners of the cover or just leave the cover off. 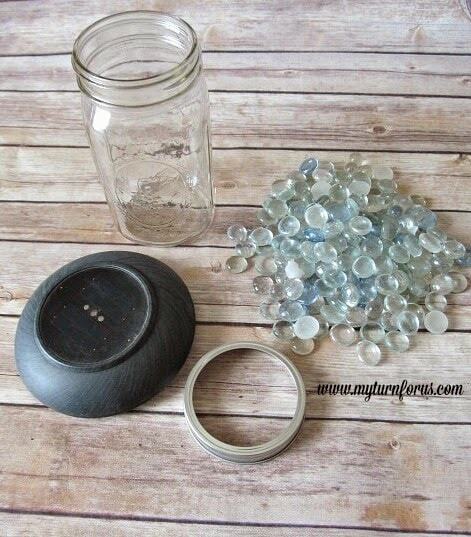 Screw the solar light on the mason jar and place outside and enjoy your evening filled with the soft lighting. 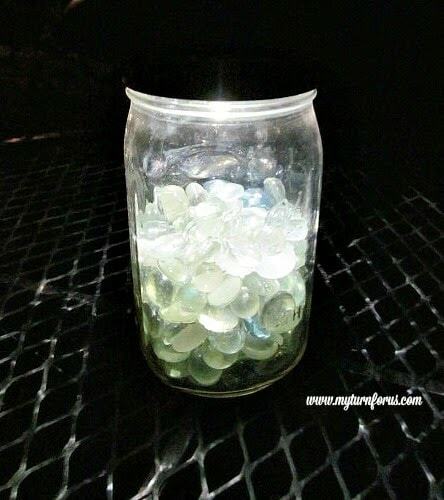 See how gorgeous these lights are with the gems reflecting the light. They are sitting around on tables and on the BBQ Pit around the Ranch yard. I just love them and the price was even better. 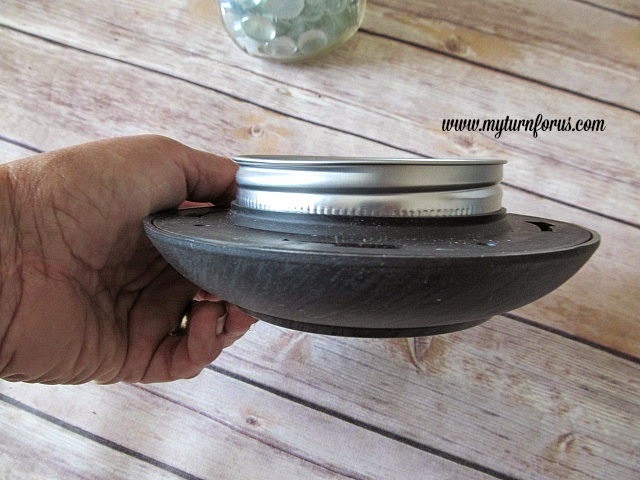 We also made these super easy DIY Mason Jar Bird Feeders. Now I know you wish to see the object of my inspiration! My friend Angie’s lights! 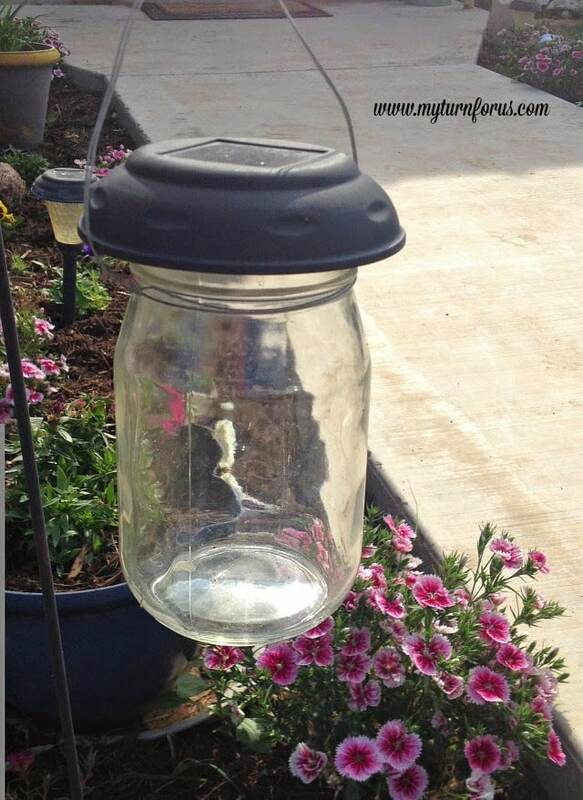 She used wire and made little hangers on each jar and they are hanging in her flower beds bordering the sidewalk. They are just gorgeous! 1. Why does a solar light need batteries? Isn't that defeating the purpose? 2. 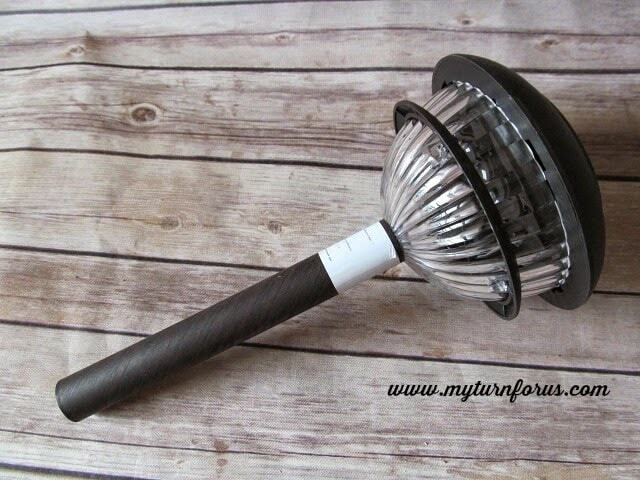 What did you do with the rest of the solar light that you bought? 1. A solar light would only work when the sun was shinning if it did not have a means to store the power. By using a battery, the sun recharges the battery during the day and then the battery powers the light at night. And repeats itself every day and night. I have had some of my solar lights over a year and have never had to change the batteries, they are still recharging themselves every day. 2. I haven't done anything with the bottom of the light YET:)) Would love to have some ideas! Beautiful Everyone, simply beautiful. I'm wondering…. My local "dollar store" sell the solar lights. (they are smaller, and I have never tried them) do you think they would work with this project? Evelyn these are enchanting. I have a question for you…. My local "dollar store" sells a smaller version of the lights. (I have never tried them) do you think they would work with this project? The cap is smaller and might need some embellishing I imagine. I'm helping my daughter plan her wedding and they would make a beautiful path down the aisle.